During my last days in South East Asia, I take a cycle trip back in time. Blue hills in Northern Laos. The Chinese border lies just 50 kilometers to the north. 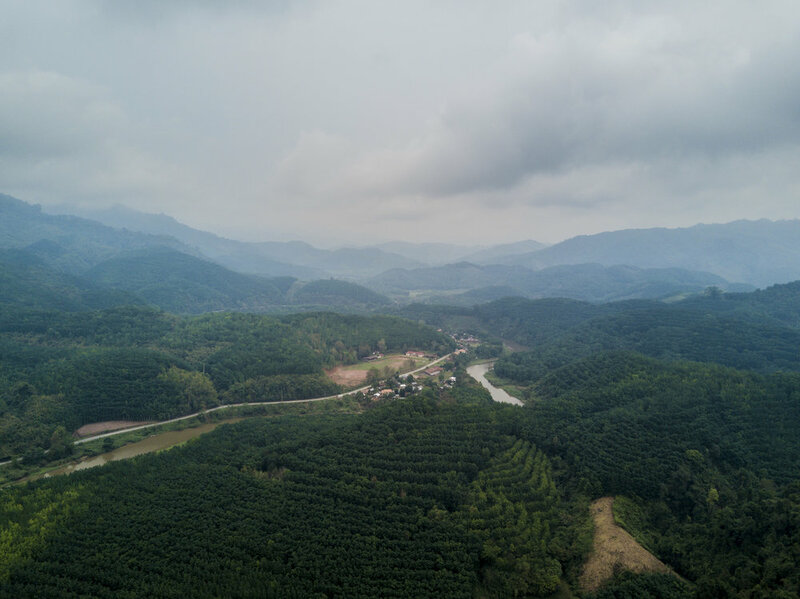 Mongolian and Chinese visas secured in Bangkok, I jumped on the sleeper to Chiang Mai and quickly moved further north, to Chiang Khong, on the Thai banks of the Mekong. I was moving fast - desperate to get away from the big city and draw the curtain on this first phase of the trip. Reaching the Mekong was a milestone. It had been over 8000 kilometers, 78 days and 6 countries since I drove off from Adelaide’s northern suburbs. To reach this famous river was to reach one of these few great geographical markers of this trip. I stayed briefly in Chiang Khong and plotted my time ahead in Laos, visible just over the river. After trawling the map, I’d noticed the Nam Tha river covered almost the exact section of Laos I needed to cross before reaching China. Malee, my host in Chiang Kong, told me she’d traveled its length just a few years prior. Excitedly, I asked her how to do it. “Find Ba Peng”, she told me. “She runs a hostel in Huay Xai across the river. She will know someone who can take you”. So first thing the next morning, I flagged down a tuk-tuk bound for the border, crossed what most be the world's most relaxed international boundary, and went searching for Ba Peng on the streets of Huay Xai, Laos. On the banks of the Mekong River in Huay Xai, Laos. Thailand in the background on the other side of the shore. Malee had described Ba Peng as an 80-something stalwart of the Huay Xai tourism industry whom everyone in town would know. And she was right. I asked around and was quickly directed to ‘BAP’, a homestay on the main strip. Entering, I looked over and saw an elderly women lying on a stretcher watching Laos’ version of the X Factor. I tentatively interrupted her and asked about traveling by boat up the Nam Tha. “It cannot be done”, Ba Peng told me in perfect English, rising from her day bed with an energy that defied her age. Surely there was someone who could navigate the shallow streams and take me north? There was no way I could find $400 to splurge on a river trip. I only had $70 for my 4-5 planned days in Laos. Ba Peng, and her brutal honesty, shattered my boat dreams. So I booked the 4-hour bus to Luang Namtha, $10, for the next morning before retiring frustrated to one of Ba Peng’s guest rooms. The following day I kept moving. I arrived late in the afternoon in Luang Namtha, a dusty, utilitarian town that serves as a gateway to Northern Laos' best natural environments, found a homestay and settled in, spending an afternoon luxuriating in the coffee and patisserie culture of one of the furthest frontiers of the Francophonie. The road back to Luang Namtha. By the afternoon, the smoke had returned, blanketing the town. I’d hoped to cycle for a day up the Nam Tha to make up for the fact that there was no chance I’d be able to see it by boat. There is a haze across northern Laos at this time of year. Every March and April, farming communities rely on old-fashioned slash and burn techniques to clear their land of wet-season growth. The result is an otherworldy fog that envelopes everything, bringing with it an acrid odour so dominant that it corrupts the taste of food, and sticks to your clothes. But the night before I cycled, a terrific storm ignited over Luang Namtha. I was woken to shaking walls and windows, assuming a minor tremor had occurred. But it was just the rapturous thunder and lightning, coupled with a downpour so heavy that the walls of the hostel vibrated under the pounding. When I woke, the rain had doused the fires and the thick smoke had cleared. The heavy, grey skies ceded to sunshine over breakfast. A cool breeze rustled my 12-week beard. The mountain air was clean and new. As I cycled northwest out of Luang Namtha, the township thinned into nothingness. The Nam Tha Valley, looking west. But the Nam Tha is a lifeline for so many communities, which quickly emerged and kept emerging every kilometer or so along the river bank. The roads were populated by more potholes than traffic, though there were a great deal of pedestrians lugging goods between roadside villages, and - like everywhere in this part of the world - extended families commuting on scooters smaller than my push bike. 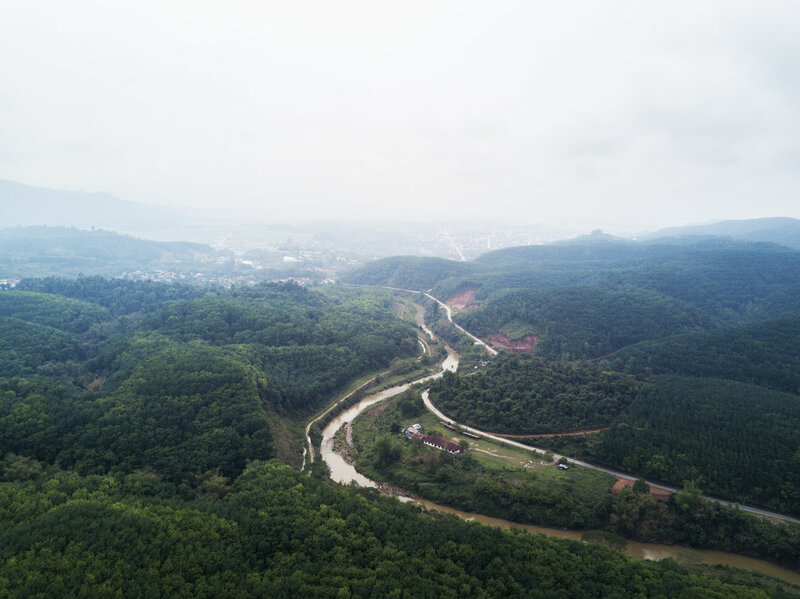 Not far from town, the dam that Ba Peng had mentioned appeared. I stopped and took some aerial photos of it. 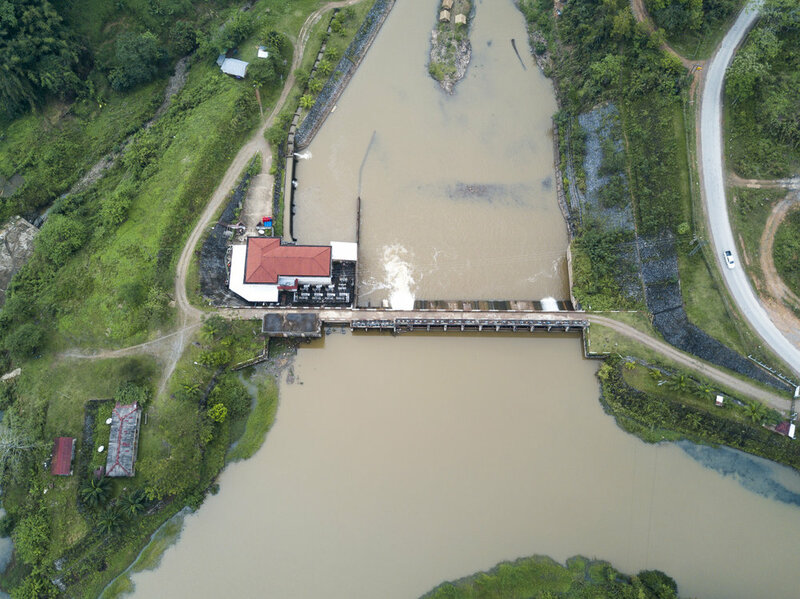 The dam is an ugly imposition an otherwise enjoyable river, though it is essential in providing the region with electricity. Its presence annoyed me - it was this man made blight on the landscape that had ruined my chances of exploring Laos’ northernmost river system from the water. I continued on. After 20 kilometers or so, the main road detaches from the Nam Tha, forging its own path west while the river cuts north . But a few small villages can be found along the dirt path that continues to hug the river bank. I darted down one path so small that even the all-seeing eye of Google is yet to map it. Soon, an old and forgotten world appeared. The only access to Lakkham-Kao. Laos, like so many countries in the region, is experiencing unprecedented economic growth. It’s GDP expands by between 7-10 percent a year off the back of tourism and agriculture, making its economy amongst the world’s fastest growing. But of course, the growth is poorly distributed, greatly benefiting those in Vientiane and Luang Prabang, while changing little in the most remote communities. I continued down the path, past one small community, before arriving at an ancient-looking wooden suspension bridge that linked the world to Lakkham-Kao, a tiny, vibrant, but extraordinarily poor community only accessible by foot or scooter. The houses in Lakkham-Kao are still traditionally built, with bamboo and wood panelling, though old bamboo thatched roofs have largely given way to rusty corrugated iron. It was Saturday, so children were everywhere, running around, naked and with abandon. The streets were of dirt and colourful clothes dried in the sunshine. I quietly crept further into town, camera drawn and mountain-bike by my side. Soon, the children had caught wind of my presence, transforming the quiet village with a cacophony of laughter and English greetings. My geared mountain bike was a hit - everyone seemed to want a ride. In the center of the village, the men were gathered, sharing longnecks of Beer Lao as they took turns riding the bike around the village with a variety of children taking turns riding on the handlebars or the rear tray. A Lakkham-Kao villager taking a joy ride on my mountain bike, village kids in pursuit. 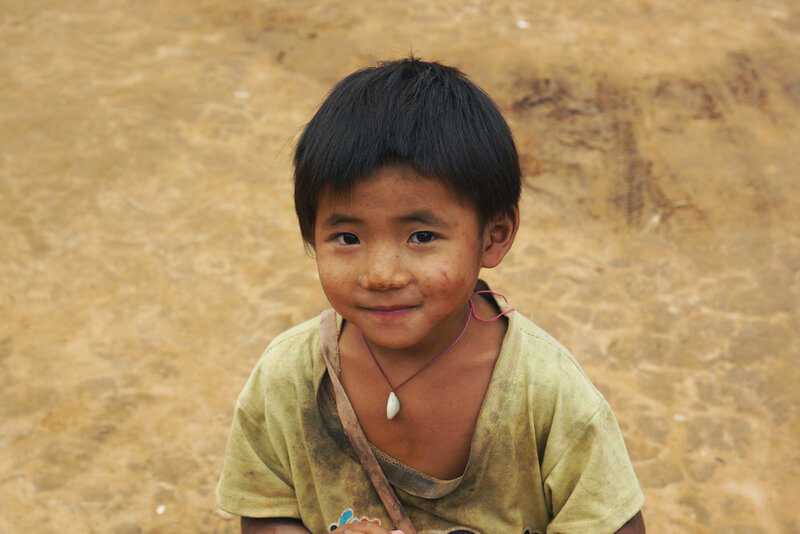 One of the quieter village kids in Lakkham-Kao. The enthusiasm of the young was typically contrasted by the indifference of the old, who ignored my presence, returning my greetings to be polite but not to engage with me in any meaningful way. As my bike did the rounds, I strolled the remainder of the village on foot. A few quieter children peeked at me around corners. Men and women laboured at their mortar and pestles. The elderly cradled infants. Livestock lived intimately alongside their masters. People washed in public pump-taps in the village center. Many slept. Some opened windows and looked down upon my foreign face. There was electricity connected to some buildings but not to most. 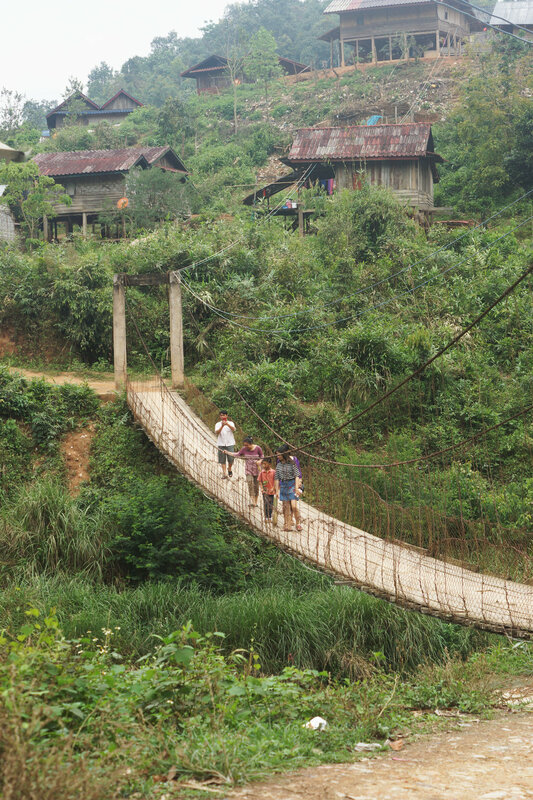 This was a Laotian village yet to see any true signs of modernity. It's easy to interpret the joy of visiting these communities as a romanticisation of them. There’s a lot to respect and admire in villagers so far removed from the modern world. They toil hard, are extremely close as families and as communities, and are always incredibly resourceful. But Lakkham Kao, and villages like it, are challenging places to live. Here, there is no sanitation and little running water. The waste of pigs and goats and people is commonplace and intermixed. There is no healthcare nearby, and some older folks looked unhealthy - their eyes jaundiced and teeth non existent. This is the reality of rural life in the Laos that has missed out on the benefits of growth. After some time, the energy of the children began to fatigue their parents - and me. Some began to pick my pockets and open my bag. Others tried to pinch my camera, then beg for money and food, neither of which I was carrying in any great quantity. I felt, after an hour or so, my welcome was wearing thin. So I politely wrangled my bike back from its latest drunken occupant and trodded off out of town. The children kept up as long as they could, chasing me as a mass out of town until my bike, the object of their obsession, carried me quickly into the distance, over the wooden bridge and back towards modernity. An excited Lakkham-Kao villager, typically pantless.